Mind the gaps in your financial processes with robotic process automation (RPA). RPA is quickly emerging as a solution to extend automation in finance because of its significant impact on transforming manual processes in procure-to-pay, order-to-cash and record-to-report. 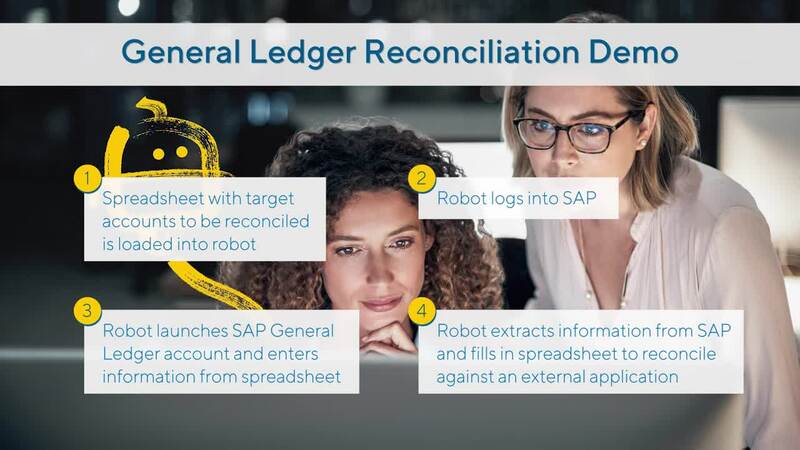 RPA eliminates data entry errors, delivers 100 percent data accuracy and slashes processing times—at a fraction of the cost of a human workforce. Not only will you immediately benefit from a swift implementation and lightning-fast ROI, but you’ll free employees from the manual “stare and compare” data entry and speed productivity. Deploy a digital (robot) workforce to connect systems, silos and processes and eliminate human errors. Save time and money by automating labor-intensive, multi-step tasks within finance and accounting. Gather and consolidate financial transactions in support of period end reconciliation and reporting. Monitor processes and trends to unlock valuable insights, maximize productivity and optimize automated processes. With the addition of Kapow, we have digitized close to 95% of AP operations, and we are on track to go fully electronic by the end of 2017. When you deploy a robotic workforce to automate repetitive tasks and manual processes and eliminate process bottlenecks and data entry errors, you transform financial processes with improved productivity, reduced costs and greater process transparency. Power your processes. Empower your business.